I’ve been doing modelling for quite a while now. (For USA readers, this is British Understatement, and really means ‘I’ve been modelling for ages and ages’). And I’ve been teaching modellers for almost as long. And every time – no exceptions – that I teach UML or BPMN modelling, I learn something new. Maybe a new way to write a Use Case for some problem I’ve not seen before, or a new way of thinking about processes and process models. I also occasionally get asked ‘how long will it take my team to get good at this’, and the answer here is ‘it depends on how good you to want to be – I’m still learning’. And this is for a modeling language which has been mostly unchanged since 1997. So when a new modeling language comes along, it doesn’t make me happy. I’m looking at 10 more years of trying to understand what it can do, what it can’t do, and how to use it sensibly. You can therefore understand my reluctance to start using Archimate. Firstly, it’s almost the same size as UML, in terms of the ideas and modeling constructs. With UML most people didn’t use it all. A Business Analyst might only use 4 or 5 models to say what they needed. With Archimate, to create my Enterprise Architecture, I seem to need lots and lots and LOTS of new model constructs. Also, lots of the Archimate ideas are very similar to the ones I know and love in UML. This seems to be deliberate, and a good thing. 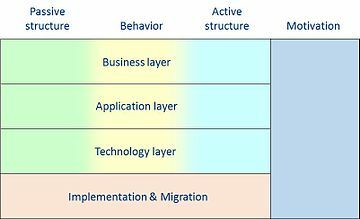 But quite a few others take old-style, pre-UML woolly thinking – like ‘Business Function’, and ‘Business Service’, and put them center stage in an Enterprise Architecture. Looking around the interweb, there seems to be a raging debate about what these ideas mean, which isn’t reassuring. Compare this with the UML idea of a Use Case. Invented substantially by one person – Ivar Jacobsen – and with a nice simple definition. Teaching people what a good use case looks like is fairly simple. But what does a good Archimate ‘Business Function’ look like? But anyway, my customers now want to know about Archimate, and so I guess I’m going to have stick at it and learn some new stuff. I’m starting the the Open Group’s specification, as that seems to be the source of all subsequent thinking, and it’s proving clear, but rather brief, and with few examples. I’m also looking at the ArchInsurance example (trying to find a link for this…), but again, not really enough explanation. I also bought Gerben Wierda’s “Mastering Archimate’ book, which I have to say is quite the worst modeling book I’ve ever come across. It’s a real ‘look how clever I am’ book, talking as it does about Wittgenstein on page 1, then diving straight into the Archimate meta-model. Few examples, little reasoning about why he decides to model things in one way rather than another. Avoid. Anyway, back to the books and the interweb. If anyone knows of any GOOD books or articles about Archimate, please let me know. I’m going to need them. When’s the last you read an IT book from cover to cover? It even took me a few tries to get all the way through ‘Mythical Man Month’, and that has deep wisdom on every page. I’ve put a link to this review of Mastering ArchiMate (though it is just one paragraph) on the book’s home page with the quote “quite the worst modeling book I’ve ever come across”. I do think, however, that your statement “Few examples, little reasoning about why he decides to model things in one way rather than another.” is rather unfair. There are 345 diagrams (not counting the display of the elements when they are introduced) in the book and 220 pages that are mostly reasoning about why one models it one way (or sometimes another) and often the patterns are built up step by step. The official standard has about 60 example diagrams (and 80 figures, e.g. showing how a concept looks). I seem to have hit on an allergy with the a small section in the Introduction on Ludwig Wittgenstein. I’m sorry I did. Setting aside Uncle Ludwig, I stand by this admittedly rather brief review of this book. I approached it as an experienced modeller, with some experience of Archimate already, and was really disappointed. Modelling seems to be about taking some aspect of the real-world, and creating an abstraction of it. Only when I understand what your examples of the real world look like can I understand why you’ve modelled it the way you have. This why Use Case people pick ‘withdraw cash from ATM’ as their example, because we already understand the context. Doing this for Archimate is much harder, as the context is much more complicated. You do have a few explanations of the context, but they are very brief, and not enough for me to ‘get’ why you modelled things the way you did. The book is meant to teach you the ArchiMate language well enough that you can start creating your own patterns for the representations you need in *any* context. I think that examples like ‘modelling the use of a spreadsheet’, ‘modelling an ESB’, etc. etc. do not need much context or story in which is explained what the spreadsheet or ESB is used for. So, I have limited the context indeed to what is necessary to explain the technicalities of the language. I think (and most do is my impression) that there is enough context for that. You obviously expect more. I’d be interested to hear more opinions on the amount of context. Having said that, almost everything in the book comes from modelling in real situations (from project architectures and current state architecture), but it was obviously ‘anonymised’ (recreated in a neutral way) because companies do not like to display their innards to the entire world. As the book says, we actually created and maintained (and it still is maintained) a several tens of thousands elements and relations model of the current state of the organisation using these patterns. Very real. I’ll look into adding “Withdraw Cash from ATM” to a next edition or create a separate post on the web site. @Ian A link for the ArchiSurance case study is https://www2.opengroup.org/ogsys/catalog/Y121 . This includes a description as well as the model itself in the ArchiMate Model Exchange file format (an XML/XSD based exchange format).